Everyone dreams. I did too. The significance of what I have achieved on Science Express could never have been understood if a series of experiences had not happened since 2015 when I entered the second semester of MSc Physics programme in Pondicherry. The year 2015 – when nothing could have gone wrong! Life was smooth, perfect… almost too good to be true. I had ambitions; academically I was on the right track, scored well in the first semester; socially, I was surrounded by friends and energy level – where do I begin; I was always running around, full of enthusiasm. I would take a sprint where I could walk; I was a regular at the gym, cycling, playing cricket, trekking and enjoying my favourite sport, sailing and yachting! But what is life without a little struggle and fate knows that all too well. As fate would have it, on 28th January 2015, I hit the turning point. I accompanied my friend to the hospital for stomach pain in the middle of the night. I slept on a chair waiting for her, until 5.30 AM and with my lower back paining, we finally went hostel in the afternoon. I thought my pain was simply stiffness from the chair and probably I had been lazy for the past two days, missing gym, reading in the library instead. Tablets kept me afloat until the morning of 7th February 2017 when I experienced excruciating back pain, so much so I could not move a muscle and I couldn’t even summon enough strength to call someone for help. Finally a worried friend came to check on me and between her panicked, hurried movements and my tears; she took me to the hospital. Ever since then, I have lived with lower back pain that suddenly shows up and there have been times when it has stayed with me for months. I have tried to ignore it, changed various doctors, have taken treatment from JIPMER hospital, PIMS, SCB Medical hospital in Cuttack, Konark Nursing Home and more. I took advice from exercise, physiotherapy to bed rest and went through X-rays, MRI, countless pills that eventually led to a positive thyroid test; gynaecological problems and severe migraines and I didn’t realize when a slow defeat started seeping inside me… Initially I didn’t tell my family; my mother doesn’t keep well and I couldn’t bear to be a burden on them. But they soon found out, grew concerned and called me home. I missed classes and when I came back my friends celebrated. That didn’t last long though for my condition worsened and I was bedridden. My friends tried to support me; they would bring me food, notes, stories from class and took care of me. I couldn’t believe what was happening; I had never felt so helpless before, I couldn’t go out of that tiny room and it was eating me up from inside, even stories from class made me feel left out. The college authorities told me I would not be able to give exams due to low attendance in 2nd semester. As a result I lost my INSPIRE fellowship from the Department of Science and Technology (DST), Govt. of India. I would go home after every semester, coming back to Pondicherry with the hope to catch up. I would attend classes for few days until my health worsened and I would be confined to my room again. My friends gang had all moved on to new classes and I felt out of place, cut-off and incomplete. I was slipping in to depression, not telling my friends or family much about what I was going through, the feelings of self-doubt surfaced and I felt as if someone had dunked me into a different world that wasn’t mine. Finally after 4th semester on 4th May 2016, I went home, completely crushed, emotionally and physically. My parents were in for a shock that I never revealed to them about not being able to give exams for all these semesters. Now they also lost all hope and faith in me. A few days passed and then they again spoke encouraging words to me. I would listen to motivational speaker, Les Brown to feel better. I and my family members decided that I would go to Hyderabad with my sister; that a change of scene would help. In Hyderabad I started going for slow walks, practised yoga and meditation. I didn’t stress myself out with activities instead I focused on self-study to give exams again and started reading Osho for inspiration and a deeper understanding of my life. Two months passed, I knew it was time I snapped back to reality; accept my reality. I began, by calling a friend from college, Shambhu from Odisha and little by little I told him my story. He thought I had completed my MSc and went through the same surprise as everyone else, scolding me for not telling him before and then like a good friend, being supportive. He told me all about an exhibition train he was on and how it changed his life; he went on excitedly as if he was discovering India in another light. 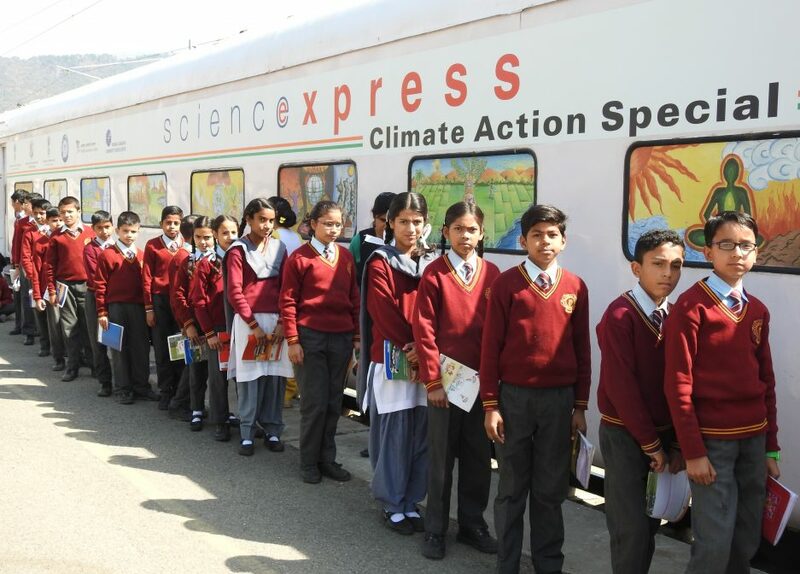 In October 2016, he suggested I should fill the application form for the next phase of the exhibition train which was none other than Science Express Climate Action Special, Phase IX (SECAS). In January 2017 I got an interview call from SECAS team and even though I acknowledged my condition was weak, hope swelled within me. My parents strictly denied me to go if I get selected, but somewhere inside I knew that life was going to come back on track. I got selected and there was no looking back. Even though insecurities still played upon my mind – my Hindi was not so great; my English had an accent, what if people laugh, what was held in store for me… Curiosity got the better of me and I left for training at Ahmebdad. Soon enough, a new adventure took me in its arms. I met new people, different people, ones who didn’t judge me and ones with whom I could laugh – Communicators, my new friends. After training period, we spent the first 40 hours in the train from Gandhinagar to Delhi and our brand new blue uniforms and ID cards transformed us into a team. My worries of language soon vanished as I decided to go with the flow and I knew, somewhere in my imperfection, I would be perfect. Travelling isn’t good for you, the doctors had said but travel, I did. I would keep myself busy in daily activities and keep negative thoughts at bay. A thought gave me strength: unbearable and unstoppable back pain was better than the pain of feeling a constant defeat, pain of lack of support, the pain of feeling like nothing; and with this thought I trudge on. If I give in to physical pain, it will take me in another direction and slowly break me as a person. Every person I met aboard Science Express has given me hope, boosting my confidence. They inspire me to keep moving ahead. Sometimes I catch these bright eyes, ones that smile at you, whether kids in the kids zone or adolescent girls and boys in Joy of Science lab, or a kind visitor; these eyes tell me that it doesn’t matter what situation you are in, what matters is what you make of it. Especially kids, they give me a chance to become a child and they make me feel like really I am someone. My pain has not disappeared and maybe I have a long struggle to take on, but Science Express is helping me come back to the world I know; my world. When I joined the train, I felt like I had nothing but now I have so much more to give back. My journey towards the extraordinary life has begun once again. Yes, I dream. You should too.